Let me tell you my friends, this Q experience is an amazing adventure for the mind. In my previous post about the beauty of D5, anons commented on the component interpreting D5 as a key and how I extracted 5 by counting the steps to get from A to E. They made the argument that the convention I implicitly used counting the first letter A, even though acceptable, was not universal and that, commonly, A to E was counted as 4 steps as confirmed by [E]-[A]=4. I thought this point was valid and a more “universal” response had to be identified. I therefore accepted the challenge of finding a stronger and non-equivocal link to extract this 5 from the sentence “Viva le Resistance”. We are basically looking for a key that will change the [a] from viv[a] to an [e], the [e] from l[e] to an [a] and not change any other letter since all the other ones are spelled correctly. As I said earlier, not using any extra convention as in the previous post, changing a to e requires [E]-[A]=5-1=4 steps and changing e to a requires 22 steps (full rotation and A becomes 27). Since the correct letters are not changed, we assign to each of them a 0 step change and the key correcting the sentence is 000(4)0(22)0000000000. Since 4=D and 22=V, the key is 000D0V0000000000. If you read this V as a roman number, what do you get? Yes, D5! Friends, Anons, let’s take a minute and appreciate the beauty of all this. Do you see how Q took their text message, built a whole strategy based on a winning D5 chess move correcting a French sentence at the exact same time a correction is occurring in France? A major French newspaper, Le Figaro, is using the verb CORRECT on Dec 5 to describe how Macron “corrected’ his prime minister in his handling of the yellow vest situation: link Do you see how this V=22 is connected to Wojtkiewicz’s 22nd D5 move and how it relates to 11.11? This is pure beauty. Thank You Q for the mind delicacy. Thank You to the Anons who forced me to push the limits and find this more powerful and elegant solution. Now let’s talk about Flynn. You all heard the good news. Welcome home General. HOOAH! Q2548 Markers are important. [Dec 4, 2017] > [Dec 4, 2018] Think No Name. As you can see, you are witnessing the amazing corrective power of D5: the D5 dynamics invert falsehood and establish the truth. Inexorably. Buckle up, things are accelerating. Q1282 Why did Flynn take the bullet? Rubber bullet? Q1282 What is the purpose of a laser pointer? I am sure you caught the Maestro’s Dec 5 tweet where he praised Bush was about Flynn right? You didn’t? Then you have probably missed Q was also not talking about Bush in Q2553 but about Flynn! Look how the Maestro’s tweet and Q2553 are connected: Img1 Tweet capital letters add up to LBTH=42, which is Bill Clinton, connection 1 to Q2553, through the funeral picture. Connection 2: 42 is also the value for AMMO and mentioned by Q: “Bait expends ammunition”. This bait is Flynn who took the advanced D5 position pleading guilty to a crime he did not commit to enter the Justice system in order to inject FISA evidence and expend the enemy’s ammo. Connection 3: Q2553 capital letters add up to OWPEOPLEBEVIL=157, which is the Jewish value for GOT which also has an English numeral value of 42. The 4th connection is the most challenging one. Look at the tweet timestamp: 8:56. What am I saying when I give you 8,5 and 6? Yes, ellipitic language: 7. What is the 7th letter of the alphabet? Yes: G. Now analyze the number of the post Q2553: what is the 2553th letter of the alphabet? Yes, it’s E because you turned the wheel Int(2553/26)=98 times and the remainder is 5=E. So? Trump gave you G, Q gave you E. What are they both saying? Yes, ellipitic language again: they are saying F. And this F is Flynn! Did you notice the exquisite choice of words from Q? He says: “Bait expends ammunition”, he’s talking about the enemy’s ammunition. Do you remember? Viv[a] vs Viv[e]? If you talk about our ammunition, you would write it “Bait expands ammunition” and this is exactly what Flynn brought back from his solitary and dangerous excursion deep inside enemy lines. HOOAH! Now let’s look at another manifestation of the D5 dynamics. We all know what happened next. 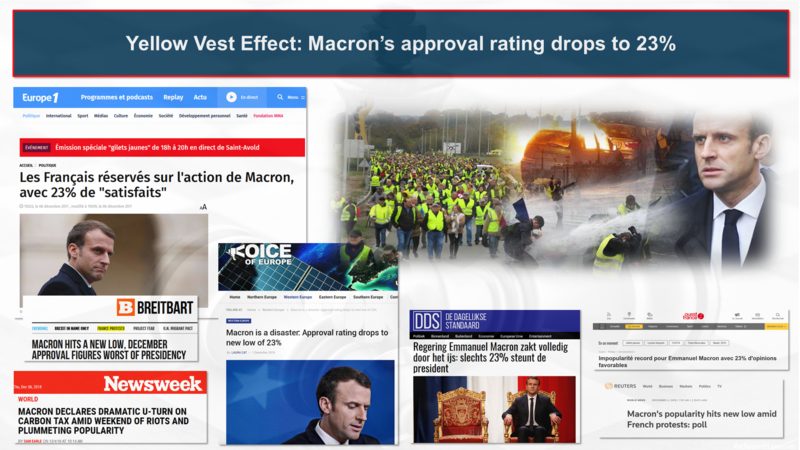 In this article, we learn the exact date the Yellow Vest protest started: “Saturday, Nov 17 is the first day of road blockades across France with nearly 290,000 demonstrators wearing the fluorescent yellow vests motorists are required to carry in their cars”.